I spend a significant amount of time reading on my iPhone just before going to sleep at night, or on a lazy weekend afternoon. The iPhone's ability to switch from Portrait to Landscape - while very useful in other circumstances - is a pain while prone on the bed, forcing me to keep my neck at an unnatural angle to read the text. I am not the only one who has this peculiar problem; I remember Robert Scoble had tweeted about the same problem at the time iPhone was introduced in 2007. Having been conditioned to get used to this uncomfortable state of affairs by the various iPhone native functionality and iPhone apps that I have used in the last couple of years, I was pleasantly surprised to see NibiruTech's twitter iPhone app TwitBird have a very simple feature to lock the screen in Portrait or Landscape. When I move the iPhone from Portrait to Landscape, a small button appears in the middle of the screen for a few seconds; pressing on that button locks or unlocks the screen in that display mode. Genius! Yet very simple! My neck says "Thank you very much, Twitbird!" 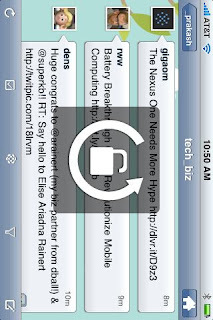 Now if only everything on iPhone - the native functionality and apps - have this functionality. 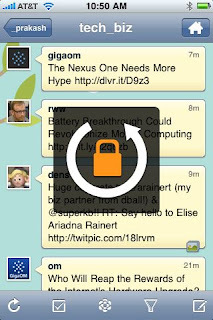 Here are a few screen-shots with the feature: First one is the locked mode; the second one is the unlocked mode. I agree. It's a simple and wonderful feature. the ebook reader "stanza" has this option too. "good reader" (for reading pdfs (incl. layout), office, iwork and many more) too.